Google has revealed the Android Distribution Numbers that have been updated this month. So, we have to bid farewell to yet another member of Android family after we were done with Cupcake, Donut, and Eclair. We are talking about Android Froyo v2.2.x. It has been removed from the updated Android distribution chart after being there for years. Back in 2010, the Android Froyo was revealed that featured some voice-controlled features. It also introduced the ‘Portable Hotspot’ feature that we all use these days. Anyways, finally, Google has decided to remove it from the Android Distribution, maybe because last month Android Froyo’s percentage was only 1% among all the other versions of Android. Back in August 2016, Android Nougat was released, but it seems that still, only a few percentage of Android users have experienced the latest Android version. As per the latest Android distribution, Android Nougat is there on 0.7% Devices only! 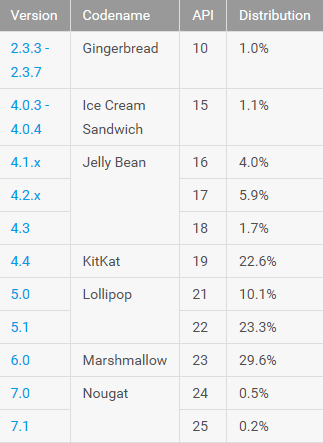 If we talk about other versions, the Android Kitkat is still widely running on Android phones as it has a percentage of 22.6% in the distribution. Also, Android Lollipop and MarshMallow are there on 33.4% and 29.6% Phones respectively. Concluding all this information, we can see that most of the devices still run on Android Lollipop which is a couple of years old version of Android.